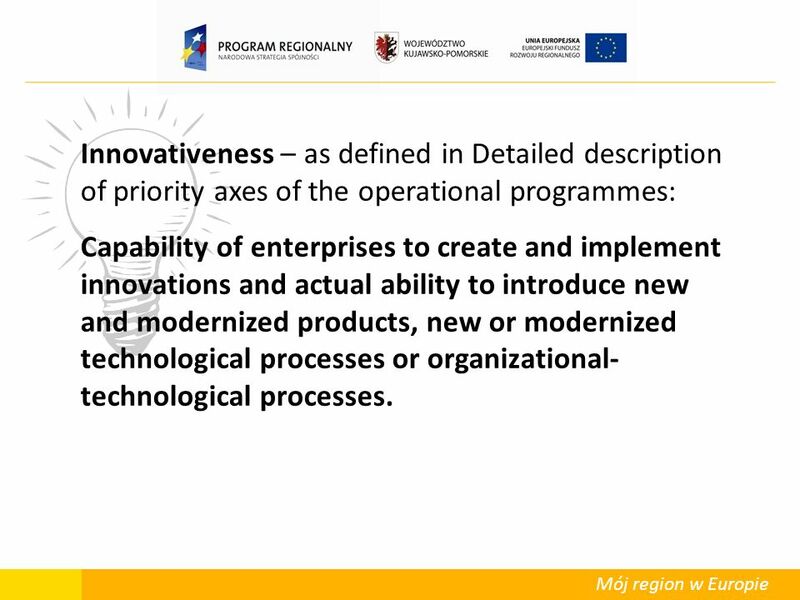 2 Mój region w Europie Innovativeness – as defined in Detailed description of priority axes of the operational programmes: Capability of enterprises to create and implement innovations and actual ability to introduce new and modernized products, new or modernized technological processes or organizational- technological processes. 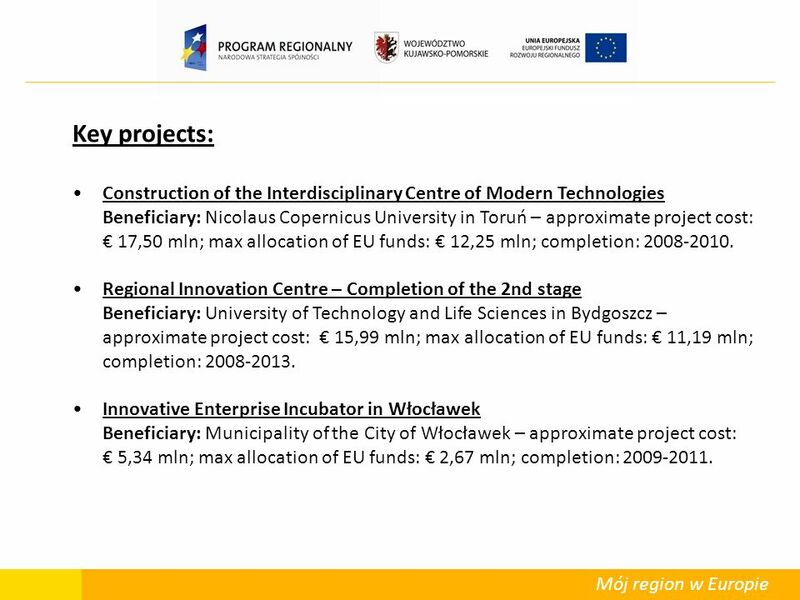 5 Mój region w Europie Key projects: Construction of the Interdisciplinary Centre of Modern Technologies Beneficiary: Nicolaus Copernicus University in Toruń – approximate project cost: 17,50 mln; max allocation of EU funds: 12,25 mln; completion: 2008-2010. 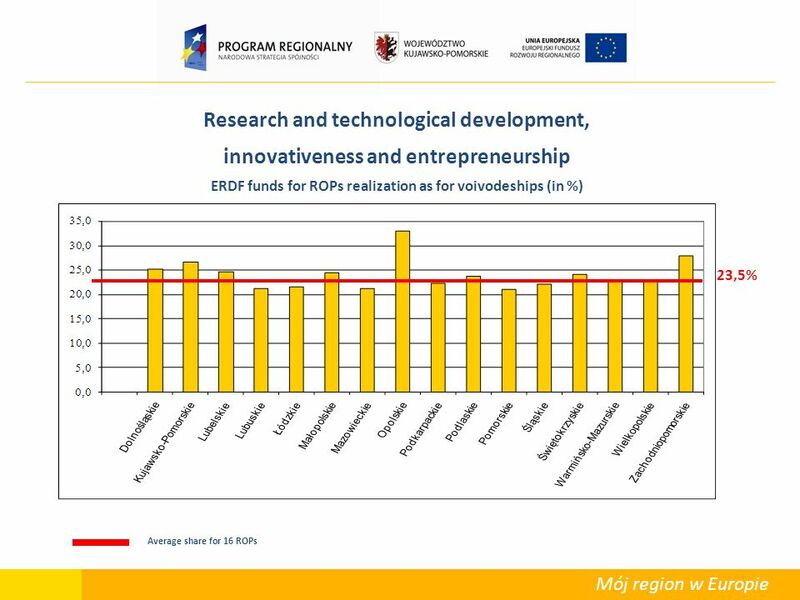 Regional Innovation Centre – Completion of the 2nd stage Beneficiary: University of Technology and Life Sciences in Bydgoszcz – approximate project cost: 15,99 mln; max allocation of EU funds: 11,19 mln; completion: 2008-2013. 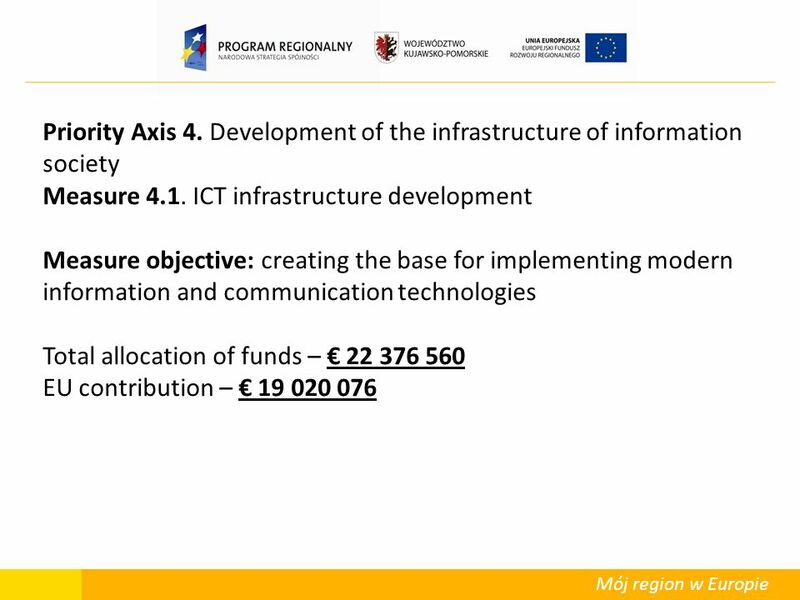 Innovative Enterprise Incubator in Włocławek Beneficiary: Municipality of the City of Włocławek – approximate project cost: 5,34 mln; max allocation of EU funds: 2,67 mln; completion: 2009-2011. 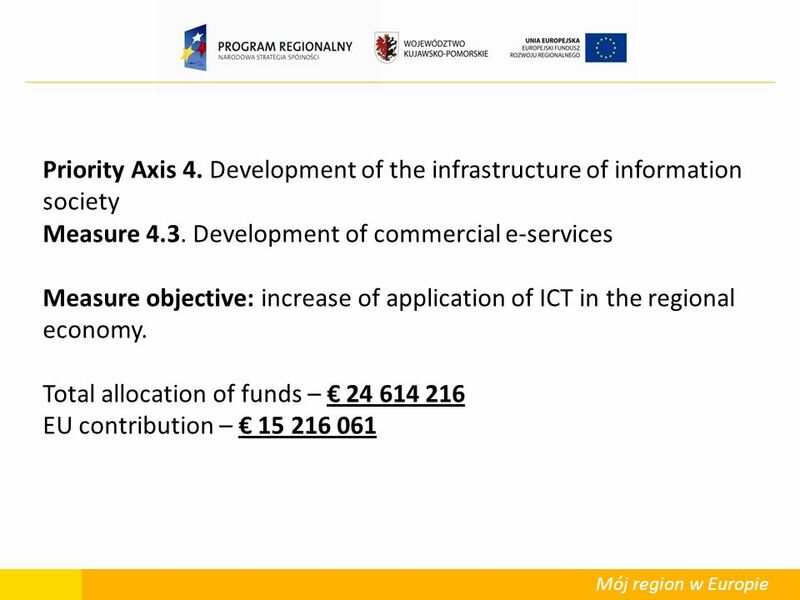 10 Mój region w Europie Key project: Toruń Technological Incubator Beneficiary: Municipality of Toruń – approximate project cost: 4 mln; max amount of funding from EU: 3 mln; completion 2009-2011. Project will be completed in 2009-2011. 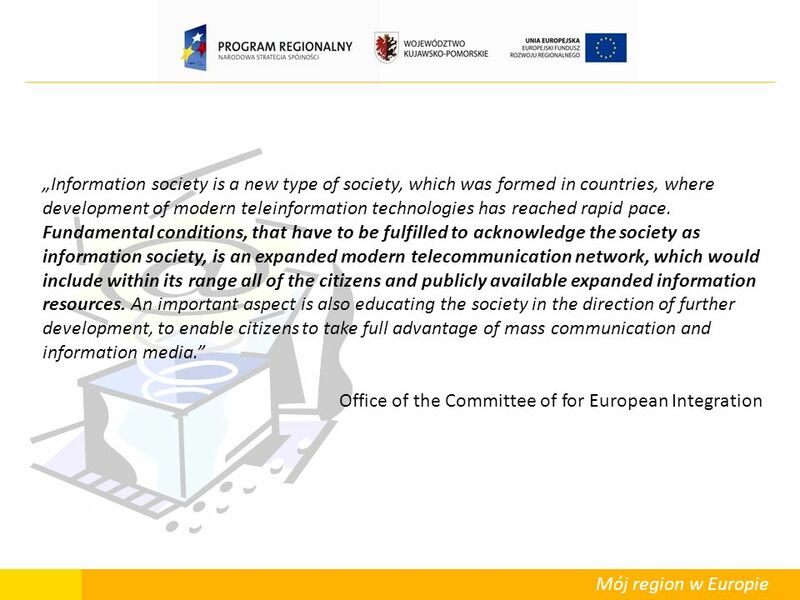 Its aim is to support enterprise and development of modern technologies in Toruń. Two postindustrial buildings of Toruńs Mills in Kościuszki St. (total area: 4004 square meters) will be renovated and converted to meet the needs of the incubator, as well as two other projects, that will be located in that complex. After the renovation the complex will be fitted with office equipment, computers and network of technical and service infrastructure. 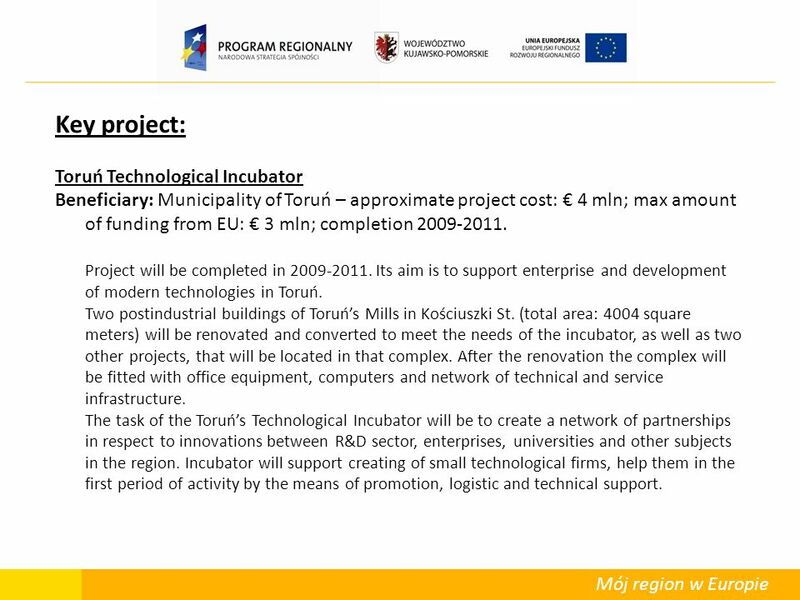 The task of the Toruńs Technological Incubator will be to create a network of partnerships in respect to innovations between R&D sector, enterprises, universities and other subjects in the region. Incubator will support creating of small technological firms, help them in the first period of activity by the means of promotion, logistic and technical support. 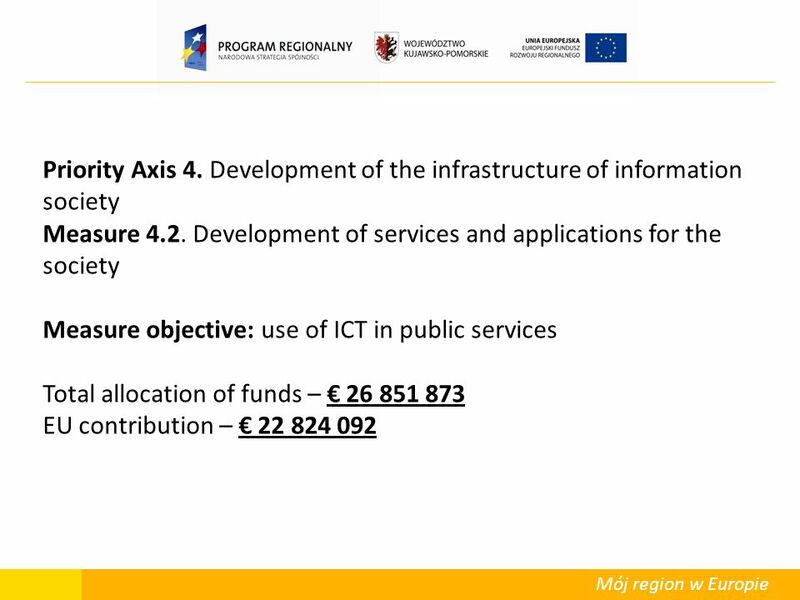 12 Mój region w Europie Key projects: INFOSTRADA Kujawy and Pomorze – services in e-government and spatial information. 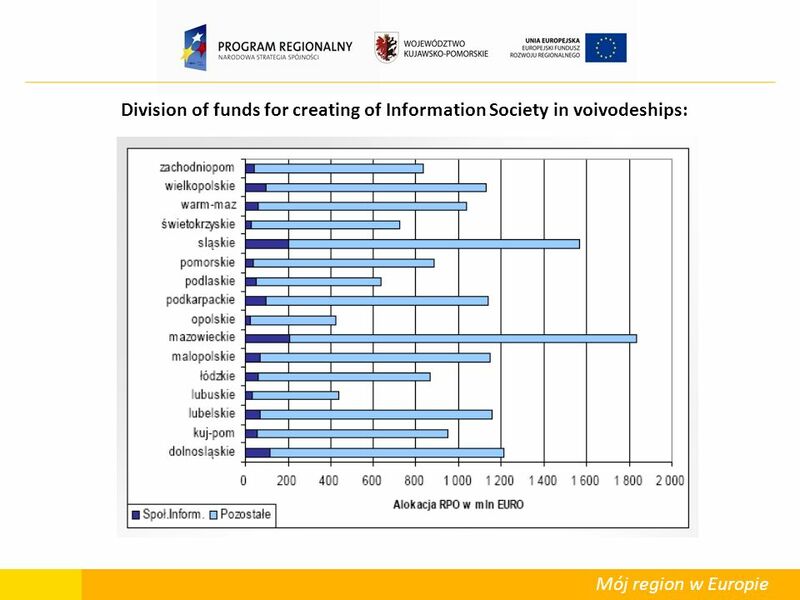 Beneficiary: The Marshalls Office of the Kujawsko-Pomorskie Voivodeship – approximate project cost: 12 mln; max allocation of EU funds: 9 mln; completion: 2008-2011. e-Services – e-Organization – package of information solutions for organization units of the Kujawsko-Pomorskie Voivodeship. 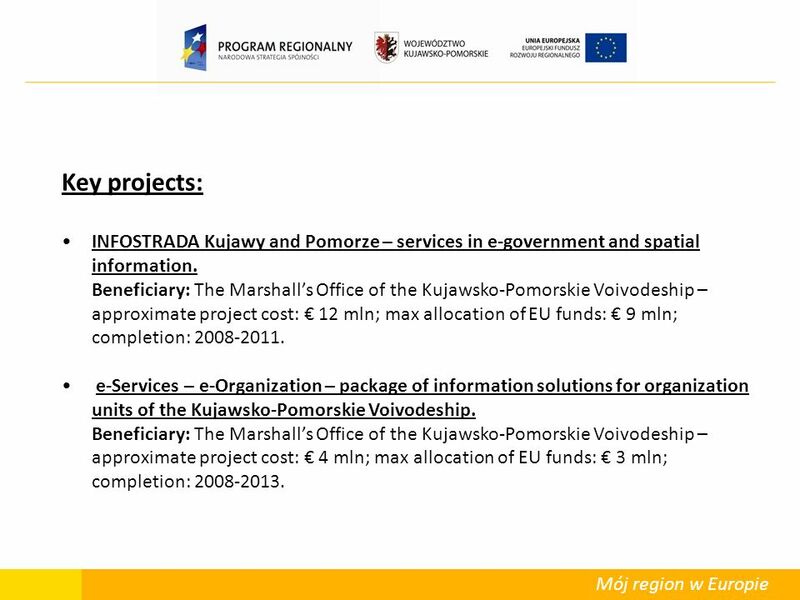 Beneficiary: The Marshalls Office of the Kujawsko-Pomorskie Voivodeship – approximate project cost: 4 mln; max allocation of EU funds: 3 mln; completion: 2008-2013. 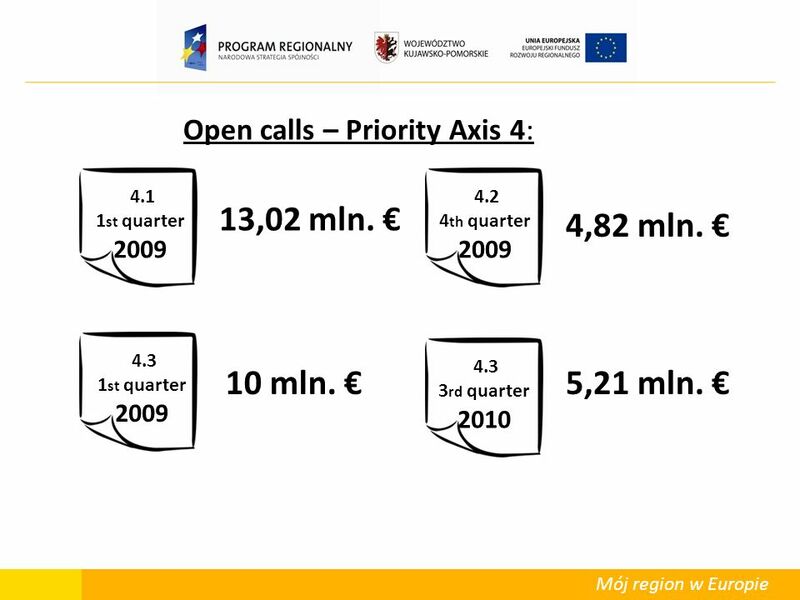 14 Mój region w Europie Open calls – Priority Axis 4: 4.1 1 st quarter 2009 4.3 3 rd quarter 2010 4.3 1 st quarter 2009 4.2 4 th quarter 2009 13,02 mln. 10 mln. 4,82 mln. 5,21 mln. 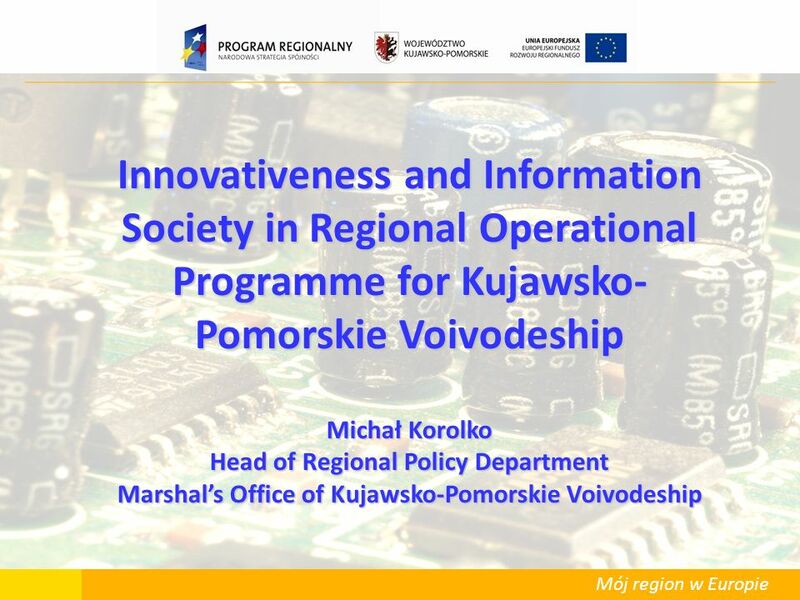 Download ppt "Mój region w Europie Innovativeness and Information Society in Regional Operational Programme for Kujawsko- Pomorskie Voivodeship Michał Korolko Head of." UNCTAD/CD-TFT 1 FDI Trends & Developments European Regional Economic Forum 2010 The Role of FDI in Developing Knowledge-Based Competitiveness in European. 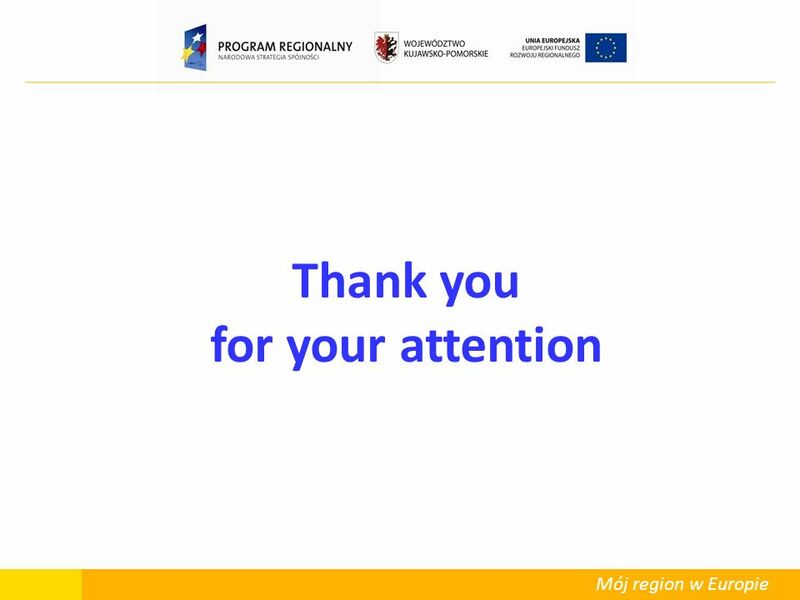 Meeting the Lisbon Strategy goals in Regional Operational Programme for Pomorskie Region for PATRYCJA SZCZYGIEL Department of Regional and Spatial. Diputació de Barcelona (Barcelona Provincial Government) Participation by local governments from the province of Barcelona in competitiveness projects. 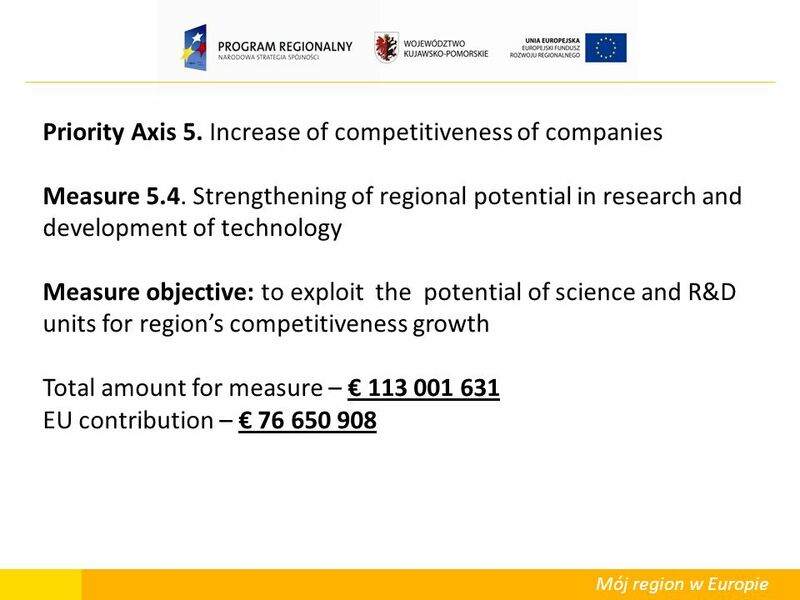 EU-Regional Policy Structural actions 1 GROWING EVALUATION CAPACITY THE MID TERM EVALUATION IN OBJECTIVE 1 AND 2 REGIONS 8 OCTOBER 2004. Brussels, October, 2005r. 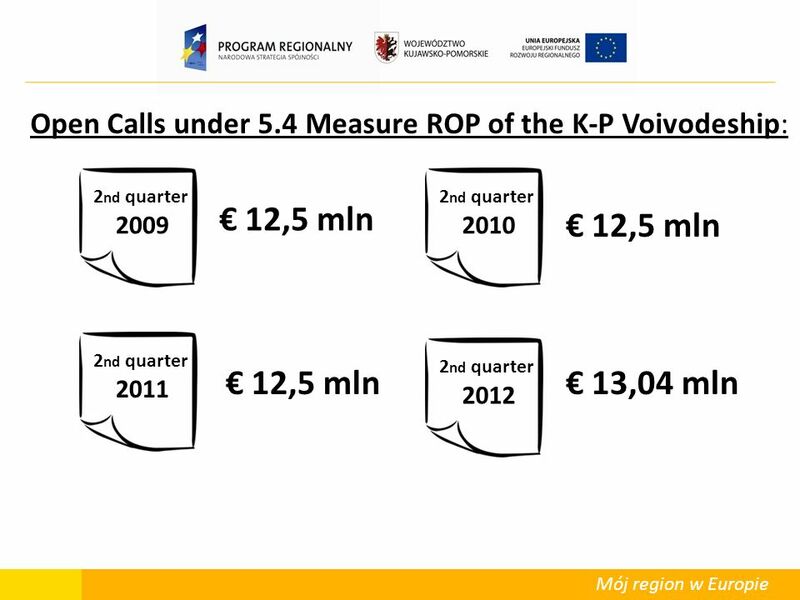 1 Kuyavia and Pomerania e-Region Kujawsko-Pomorska Sieć Informacyjna (K-PSI) Broadband Communication Network of Kuyavia.